At one time in our past we lived in a simple analog world and were content. Yet, over the last 25 years digital technologies have accelerated so much that the digital world is now an integral part of our daily lives and it is hard to imagine life without these new features. As the world becomes more dependent on digital technology, the technology that converts analog to digital and back to analog will become a necessary staple in our everyday lives. These pieces of technology are far from being the hippest, coolest, or cutting edge technology but they are necessary and companies, such as Analog Devices (ADI), that have latched onto this market are becoming dividend growth cash cows in a growing market. Being in a growth market with an attractive dividend and significant historical growth may sound like a reasonable investment but deeper digging is required to determine if the dividend and growth rates are sustainable. Note: The following financial analysis is based on LLTC’s 2015 annual report is compared & contrasted to their primary competitor Analog Devices (ADI) 2015 annual report. Both LLTC and ADI have very strong balance sheets with lots of cash & short term investments on hand to easily handle liabilities and debt but overall LLTC has the advantage. Both LLTC and ADI are seeing significant revenue growth and manage costs to generate net income extremely well. But LLTC is slightly more efficient and has the advantage. Wow, both companies have little exposure to debt! 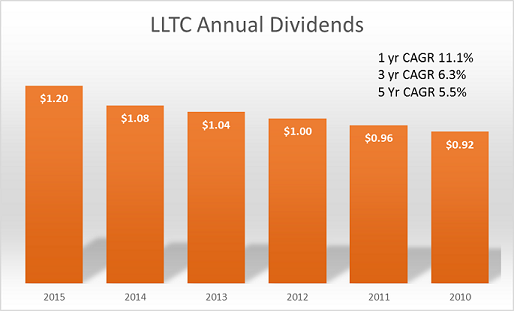 LLTC with no long term debt tilts in their favor. ADI has a clear advantage and explains why they have had the better growth rate in revenue. LLTC in previous years was spending much less than shown above but have recently dramatically increased spending. In the most recent quarter, LLTC announced an expansion of their Singapore facilities that will double their volume. With ever growing digital devices LLTC needs to follow ADI’s example with a consistent investment but the downside will be a drag on profitability & free cash so they need to find the right balance. LLTC’s 5 year P/E average is 20 so its current share price is in-line with historical share price. ADI’s 5 year P/E average is 21 so it is slightly overvalued to current prices but does have a more favorable book value. LLTC is a solidly run company with great operating margins and no debt. Their dividend and future dividend growth are on solid ground and I’m expecting a growth rate from 7 to 8% annually going forward. A fair share price is $45 and anything below $43 would be a bargain. Their overall financials compare well to their biggest competitor and I do slightly favor LLTC due to operating margins but I would not be shy to buy ADI if the share price drops below $55 a share.